Sarah Jane Sleath was the only girl in a family of six boys including twins. She was born at Outwoods, Staffordshire in 1869. She lived with us when I was growing up in Edmonton. All I really remember was a tiny, old woman in a bed, and I was taken in to visit her once a day. By the time I was four, she had been moved to a long term care hospital. My Dad and I visited her at the hospital, but on one visit, after my dad let a nurse carry me off to a ward, thinking I was a new admission, I was never allowed to go again. Who knows what my dad was thinking that day? My mother was very angry with him. I vividly remember a long room with beds along both sides filled with children. Then my dad and another nurse came rushing up to retrieve me! Sarah Jane died in 1954 and I recall seeing her coffin in the boxcar on the train while we waited at the CPR station. We were going to Red Deer for her funeral and burial in the cemetery next to her husband John Thomas Perkins. Not sure why they were buried there. Her brother, Jack Sleath and his wife Clara Annie Shotton, were buried there as well, but they had lived there. Over the years, I heard comments from different people. They all recalled that Sarah Jane had quite the temper and wondered how my grandfather dealt with it. She was a little bit of a thing, standing about 4 feet 10 inches, at least that’s what she looked like in pictures. Some say I look like her. Perhaps my temper is justly inherited. Who was this woman I barely knew? While searching some of the trunks kept in our cellar, I came across a beautifully decorated box. 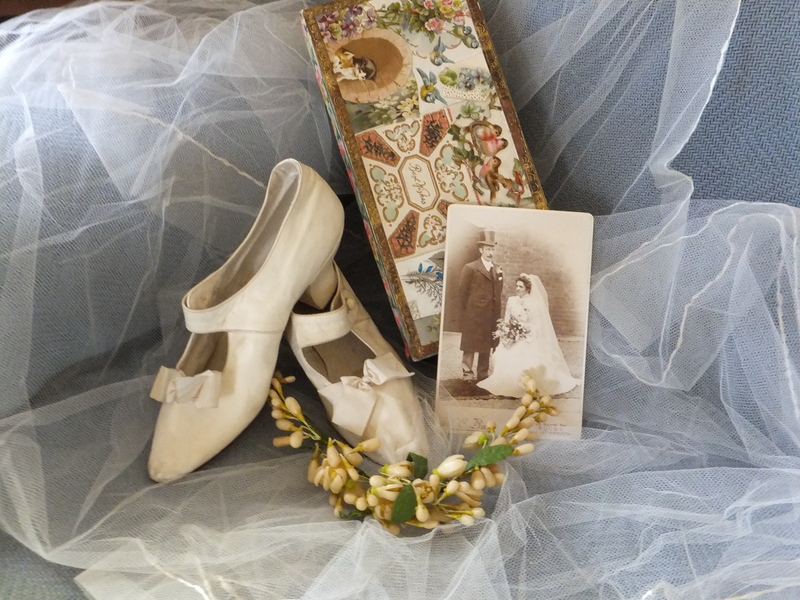 In it were white shoes and a wedding veil. I had seen pictures of my grandparents wedding and knew they must belong to Sarah Jane. She married John Thomas Perkins May 5, 1901 at St. Peter’s Church, Claybrooke Magna, Leicestershire, England. Prior to that she had worked as a Parlor Maid at Claybrooke Hall. Her employer was Miss Simpson. I often wondered what life was like for domestic help in Victorian times. What would she have done as a parlourmaid? Quoting from “Women’s Lives” a book on social history from 1800 – 1930 by Jennifer Newby , “parlour and housemaids’ duties were often interchangeable. The main division was that parlourmaids answered the door, served tea and did the lighter cleaning. Housemaids undertook the heavier work, rising at dawn to light the kitchen fire, heating water, beating rugs and other heavy cleaning.” Both types of Maids would also make beds, clean rooms, do sewing and mending and keep the fires going throughout the day. Days off were few and far between, but Sarah Jane managed to meet JohnThomas Perkins the village Blacksmith. Perhaps it was at church, as servants often accompanied their employers to services and in this instance, St. Peter’s Church was just across the road from The Hall. In Sarah’s wedding photo, Bessie Tyers is pictured with the family, so I assume that Sarah and Bessie had developed a relationship while working long hours at The Hall. There is one unidentified woman who could also be from The Hall, perhaps Janet Taylor, the nurse. My grandmother’s life would change when she married. In just a few short years, she, her husband John Thomas and son Tertius, would leave England to make a better life for themselves in Canada. The city she moved to was just getting its start in 1913 and was rough and rugged. Her house in the Ritchie District had a barn for her cows and chickens and a big garden to grow vegetables. She had brought all her furniture including a piano and a grandfather clock, fine china, pictures and a mangle. Container shipping isn’t a new thing! Sarah Jane had seen dramatic changes in her lifetime. Wish I had been able to hear her story firsthand. “Old Pictures of Claybrooke Magna, Claybrooke Parva and Ullesthorpe”…….and Why I Joined Facebook! I have always asked myself “Why would I ever join Facebook?” Now I have my answer. It is so I can connect with all the others who live in, have lived in or have ancestors who have lived in “The Claybrookes and Ullesthorpe” in Leicestershire. 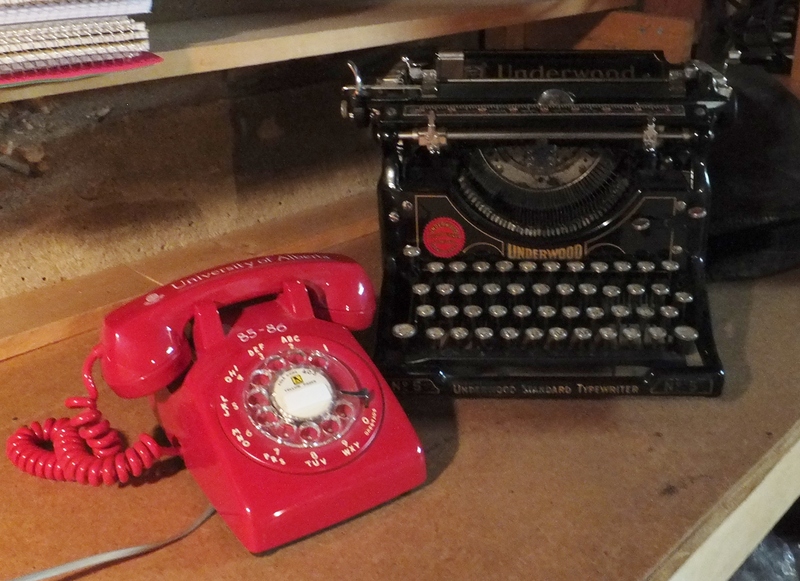 YES, I have finally come into the 21st Century…..from my Red Phone to my Smart Phone, from my Underwood Typewriter to a Laptop Computer, from hand written letters to postings on Facebook! Who would have thought such a thing possible? Well maybe my Dad, after all, he was a telegrapher and the fastest typist I knew and he had a Ham Radio back in the 50’s and 60’s and he would “chat”, albeit in a somewhat different manner with others around the world. How he would have loved Facebook! It all began earlier this summer, when someone responded to a post I had placed on the Leicestershire Village Website in 2009 asking for help in locating any living Perkins in the Claybrooke Magna/Parva area. Over the July 1st Long Weekend, someone responded that they thought they knew of a connection and would get back to me. I think they gathered in the Pig in Muck, the local, to solve the problem. Soon I had an email from a living Perkins, a descendant of Walter Joseph Perkins, brother to my grandfather, John Thomas Perkins. Emails and pictures went back and forth across the Atlantic as we caught up on 100 years of family history. You see, my grandfather, John Thomas had left England in 1913 to come to Canada. Once here, there was minimal contact with those back in the village. My Dad made only one trip to the Old Country in 1932. It wasn’t long after this happened that I had an email from someone saying that, if on Facebook, I should check out this group who was posting info and pictures related to The Claybrookes. I did and I’m hooked!!! Can’t believe what I have discovered about the villages and their inhabitants going back into the 1800’s. The pictures are absolutely marvelous!!! And the memories they engender are wonderful to hear. Young and old alike have been sharing what they have dug out of trunks and other storage boxes. So far the group has 158 members, not bad for only being in existence for 3 weeks. Who knows who will find us in the future! Summer here is almost over and it has been quite the summer. It began in London at the Diamond Jubilee Celebrations for the Queen with a spur of the moment trip and ended here in Edmonton with The International Fringe Theatre Festival -Village of the Fringed. In between, there was a multitude of Festivals…..Jazz, Blues, Symphony, Folk, Rock, Street Performers, Open Doors for History and Heritage Days….the choices were yours. Time now to get ready for fall and my trip to China. No, I will not be looking for any ancestors. This is the trip that I have always dreamed of doing….when I return there will be plenty of time to look for ancestors.